Sorry for giving the appearance that I fell off the virtual map, I just had the worst case of Food Poisoning and/or Norwalk Virus, complete with several hospital visits, and am only now feeling like I have the energy to do anything productive with my time. Basically, I now have a rather fast heart rate, and they aren't sure why, but it seems to be normalizing on it's own now too. This "Look Of The Day" has been sitting in waiting since March 5th, and it's about time it got it's due attention. It is somewhat amusing that this look includes the adorable BareRose Key of Heart Bag in Red. I love coats, particularly ones that make nice use of prim pieces and have some nice appropriately sized prints on them, like this AOHARU Red Check Short Trench Coat. I really love the collar and waist tie on this coat in particular, and the red plaid is really fresh and spring like. I paired it with a simple pair of black jeans from *AnnaH* (now .:Storin:. ), this pair was part of the Heart of Love Limited Edition Laura set. The shoes here are a perfect matching red from Lya, the Sakura platform wedge pump was a gift from one of the Retrology event hunts, and are a really fantastic basic shoe. I loved the way the open collar of the coat looked with the [Armidi Gisaci] Gunmetal Niama Necklace, a great layered look adding a lot of impact at the throat. Other accessories include the adorable Kandy Kitty Mod Love Ring, and a simple ITF Dual Ball Brow Piercing. This amazing wig is from Maitreya, the Piper II is soft fresh perfection, with a bobby pin tucked on one side, and it's smooth silky texture. It is a remarkable wig and looks particularly realistic. I have been wearing the -AnaLu- *InRainbows* skins almost exclusively since Ana dropped a review pack of them on me when she first released them. I love the soft lips, the lovely brow, it is a luminous and unique looking skin. 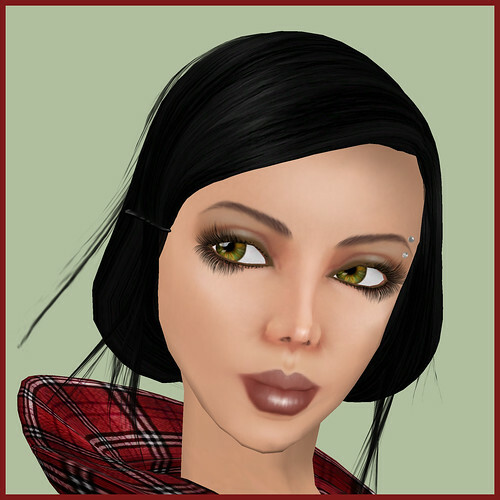 The lashes are Thora from MMS, but might now be available at LeLutka, while the eyes are the amazing Miriel Hazel Eyes. A soft and sweet look, getting to the heart of the matter, which is that I have actually missed all my friends in the online community and blogging for you all very much. Skin - -AnaLu- *InRainbows* NAT13 .brownish. 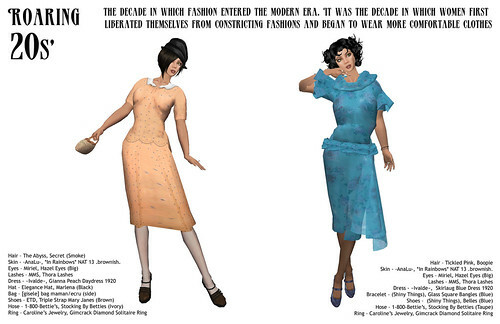 This month, Vain Inc. took a trip through time, and I did my best to bring the fashion of the 1920s alive. 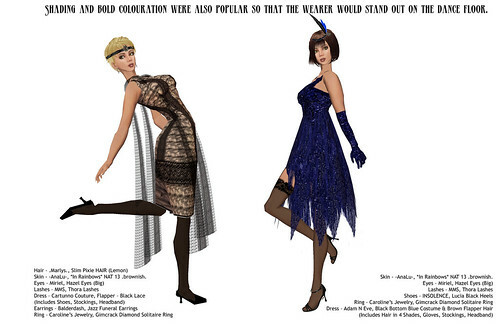 Fabulous dresses from ~Ivalde~, Cartunno Couture, Greenwood Designs, Adam N Eve, Rebel Hope Designs, & Simone. 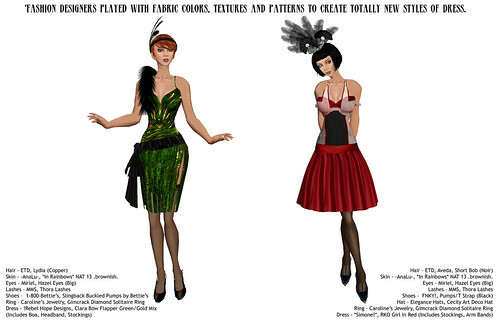 Hats, wigs, and shoes to suit the style of the era. Click the images to see larger versions with credits on my Flickr Stream. Sometimes you just need to have a good cry. It's so hard to get the face of an avatar to express emotion. Sure you can get an Emoter HUD, an often passed about full perms item, but it has a limited range of mostly comical expressions. It is often the skill of the pose maker, the lighting, the angle of the eyes that allow the appearance of emotion. Then often some post processing, be it Photo Shop, or a similar graphics program, is often the way we add emotion to our in-world snapshots. But what if you want a straight screen shot, are unable to post edit, or need to express sadness in an in-world event, drama, or show. 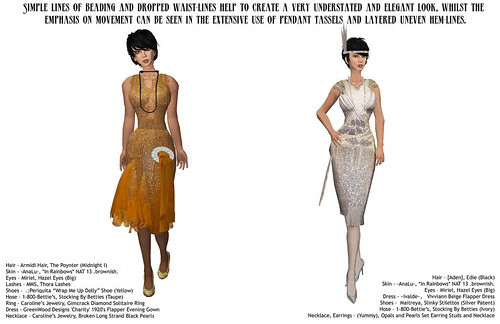 This is where the remarkable Kala Bijoux of Material Squirrel has given me yet another reason to adore her. Her new Real Tears scripted attachments can give you the look of tears without any post-processing. The unit attaches to the face, and if you click on it you can customize the look of your tears (highlight transparent items is helpful to find it and adjust it's position). 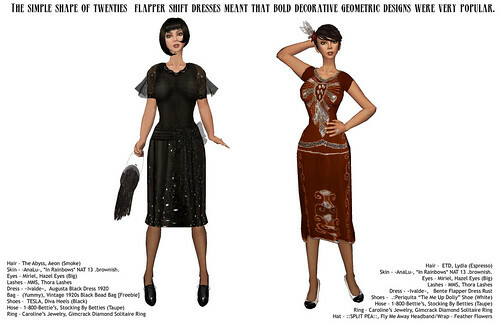 Whether tinting the teardrops, adjusting the number of drops, or the speed that the drops fall, it is a really interesting and unique wearable, and I was thrilled when Kala dropped some review copies on me this week. There is also a version that cries bloody tears, for all the Vampire roll-players who might enjoy for some really dramatic flair. The tears come in male, female, and child avatar sized versions, and there are 2 attachment points for the female sized version so that you can wear your favorite lashes at the same time. For the Photo Shop phobics, like myself, it is a really great item to add some drama to your pictures. Give then a try if you want to add a little emotion to your Second Life. It's alright to cry, crying gets the sad out of you. Skin - -AnaLu-, *In Rainbows* NAT13 .brownish.